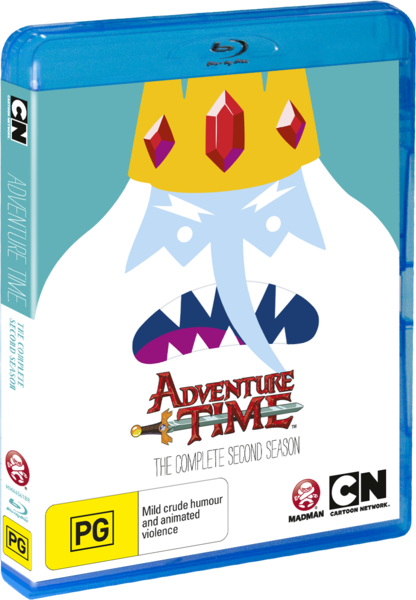 Adventure Time: The Complete Second Series contains more fun filled tales about our two favorite brothers, Jake the Dog and Finn the Human (Finn was adopted). 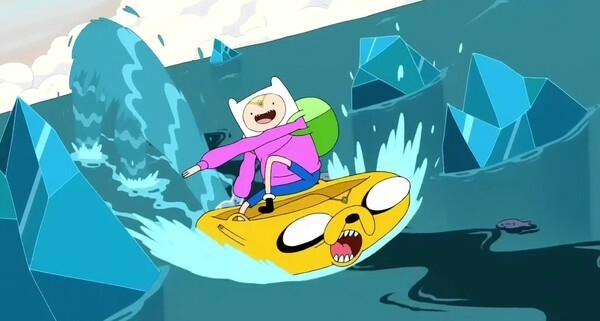 Finn and Jake are adventurers and love going out on long journeys, exploring dungeons, and rescuing people and princesses just for the sheer fun of it. While not adventuring they are resting in their tree house playing video games or eating ice cream... And sometimes both at the same time. Life is great when you are a hero but there are some people out there who don't find their lives so nice like Ice King, a villain who has the power to freeze things, and Goblin King who is just a huge jerk who likes to spank things (watch your bottoms). 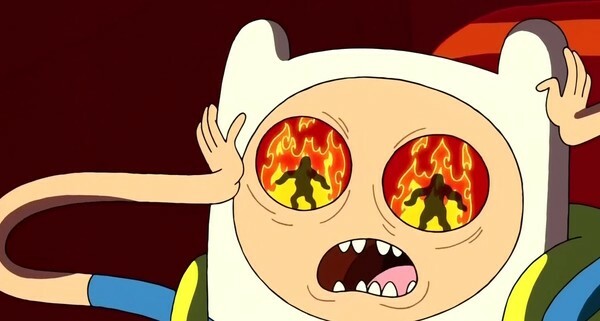 A lot of classic episodes happen in this season including: Finn and Jake becoming servants of the Nice King (who is the Ice King with a nice clean shave), Finn and Jake trying to get a bunch of royal tarts to a peace convention, Finn and Jake going crazy while being spied on by a goofy looking horse, battling the ruler of the underworld AKA Marceline's dad, our heroes trying to become vampires after trying to get Marceline (their friend who is a vampire) to watch an old movie with them, and lastly we are introduced to one of the more major villains named "The Litch" (Dun dun duunnn!). (Click "Read More" to read the full review). Storytelling in this season is a lot tighter than what it was in the first season which is really good and it really shows as every (and I mean every) episode in this season is classic. Not only can this show be enjoyed by children but adults will also enjoy this show as much (or even more) than the children themselves. If you haven't seen the first season do not worry as you can jump into this show at any time as the show is episodic (minus the rare few episodes that has an ongoing storyline). The episodes are fully uncut as well which is good as Cartoon Network seems to cut out all the good stuff here in Australia. There is a lot of humor in this show and it does it pretty well making me laugh until my lungs turn into bagpipes (AKA till I laugh so hard where I cough from choking from lack of air). Some of the humor is very crude though and may not be appropriate for younger children but us adults will sure appreciate every single minute of it. Action is very exciting and will make you jump out from your chair and reenact the action scenes while going "Hoy-yahhh Wataooo" just like in old martial art films. The characters are what make this show so darn good as they are extremely charming and fun and you'll fall in love with both the good guys and the bad guys immediately. Artwork in this show has a basic but fun look with some very nice looking scenery and really bright colors like old Warner Brother cartoons. Characters look very nice with a mixture of cute and horrifying looking characters that stand out and are all very memorable. Animation looks very good and very smooth and I do quite like how it can be animated in a very exaggerating way in some scenes as it adds to the classic cartoon look. Voice acting in this show is very fun with voices that match the characters perfectly and helps make the characters as good as they are. The soundtrack in this show is okay with a mix of folk rock and techno but you really won't be paying attention to the music. Special features included on this release are: Audio commentaries from the cast and crew on every episode in this season. The commentary tracks are what you would expect as you get information on what it was like working behind the scenes, trivia and bonus tidbits about the episodes, and the occasional clowning around with the cast and crew on the commentary tracks. There is also a feature where we see Pendleton Ward interview the crew that worked on this show. I'd recommend skipping over that one as it was brutally bad to watch as all you see is the crew watching a video full of fart sounds and you only see their reactions. Overall this is a very brilliant season of the show and is sure to go down as a classic without a doubt. Highly recommended.